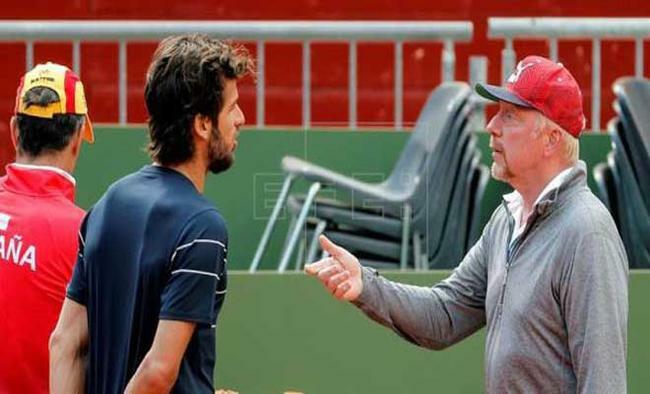 Valencia: The Spain and Germany Davis Cup teams trained on the clay court inside Valencia's bullring, the iconic Plaza de Toros, which in two days is to host the international men's team tournament quarterfinals. After two days at the bulling, the squads are to hold their final practices on Thursday at the Sporting Club de Tenis, reports Efe. The main highlight of Wednesday's practice was Spain's Feliciano Lopez, who trained for the first time after a fever had kept him out of action. His teammate Rafael Nadal, the undisputed "king of clay," is to return to the court for the Davis Cup clash with Germany, set for April 6-8. Due to a leg injury, Nadal has not played an official match since the Australian Open in late January. Before Spain's session, Germany's Alexander Zverev and Philipp Kohlschreiber hit the court to complete their training under the guidance of tennis legend Boris Becker. Both teams had to halt their sessions several times due to strong gusts of wind, but calm conditions are forecast in Valencia for the three days of the competition, with a chance of rain on Saturday.